How do you encourage teams to think “creatively”? What about to “iterate” on an idea across multi-disciplinary teams? Or to encourage broad “ideation” on a tough problem? Of course there are lots of different processes you can employ, like building a playbook. These plays are step-by-step guides used by any team to help them run effective workshops at different stages of the product development lifecycle. Or you could create large scale design education programs. This helps teach everybody in your organization to think like a designer. But what about the design of your physical office space? Imagine taking a team of highly creative people and sticking them in sterile, lowest-cost-per-square-foot spaces, and expecting them to achieve the best work of their lives? It would be much harder than it needs to be. That’s why we’ve been focussing heavily on the design of our work spaces, to create flexible, engaging, delightful, and productive places for our teams to work in. Ideation can be both an individual activity or a team-based one. I often need quiet time to really think through an idea. I need to get it on paper, a whiteboard, or in digital format to help me properly understand it. Others may need to bounce ideas off teammates first. Chaining people to their desks (or cubicles) is a sure-fire way to kill great ideas and creativity. 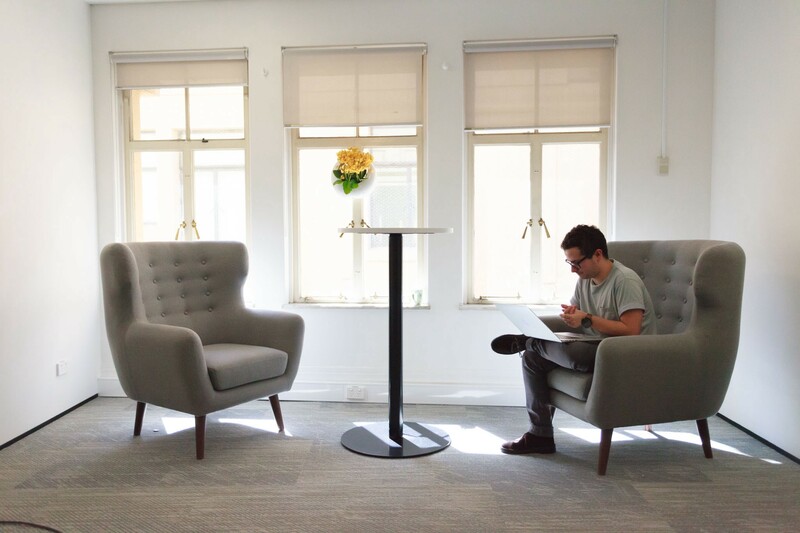 Over the years, we’ve evolved our office space to include a number of informal breakout areas for staff to sit and work independently or as small teams. It’s as simple as adding a few chairs, couches, standing high tables and bean bags. 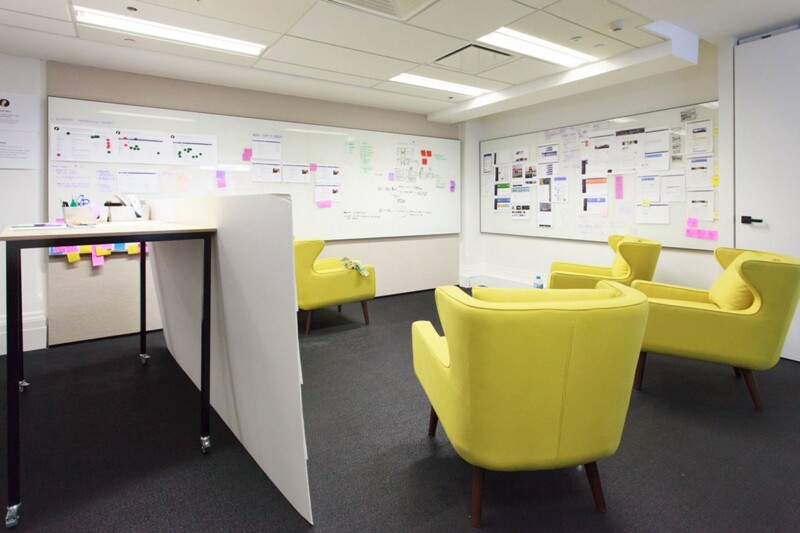 For us, this evolved into sofas and chairs around whiteboard walls to further encourage informal ideation among teams. Many meeting rooms are a standard board room configuration, with only a single long table. These are quite restrictive with how you can use the space. We’ve made sure all of our meeting rooms are adaptable, using multiple smaller tables that are on wheels and can be folded. Every meeting room contains a set of facilitation tools. A simple, inexpensive timer that encourages meetings or workshops to stay on time. Stationery for teams to sketch, capture notes, or visualize on whiteboards in the moment. (No time-wasting searches for a whiteboard marker!) Finally, we have our rubber chickens. Yes, that’s correct. Rubber chickens. 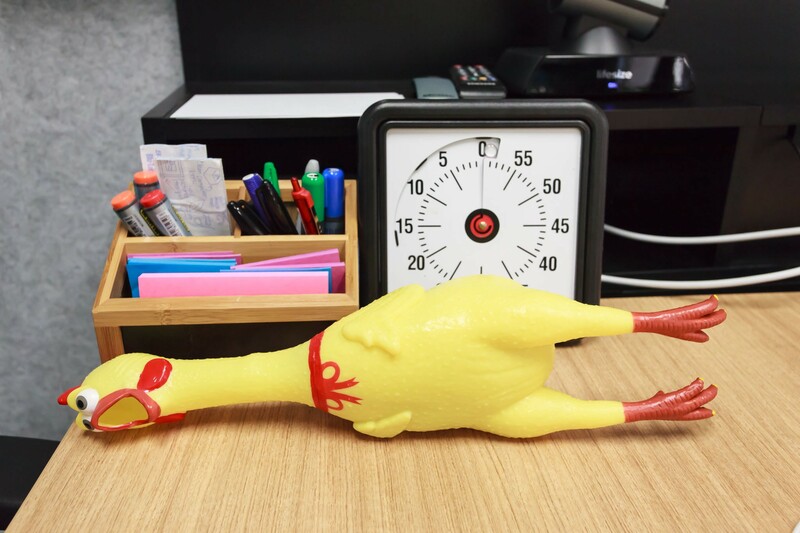 If someone is dominating a meeting, or rambling off topic, simply grab the chicken, squeeze it and it makes a terrible noise. This gets the meeting back on track. (And gets the message across with humor, not animosity.) These simple tools have been adopted by every team to help facilitate collaboration. While we are careful not to isolate ourselves as a design team, we do have a few design-specific spaces. These can be used by cross-functional teams when they need a large space to work through a tough problem for an extended period of time. The space is modular, so it can be configured to host large or small teams comfortably. 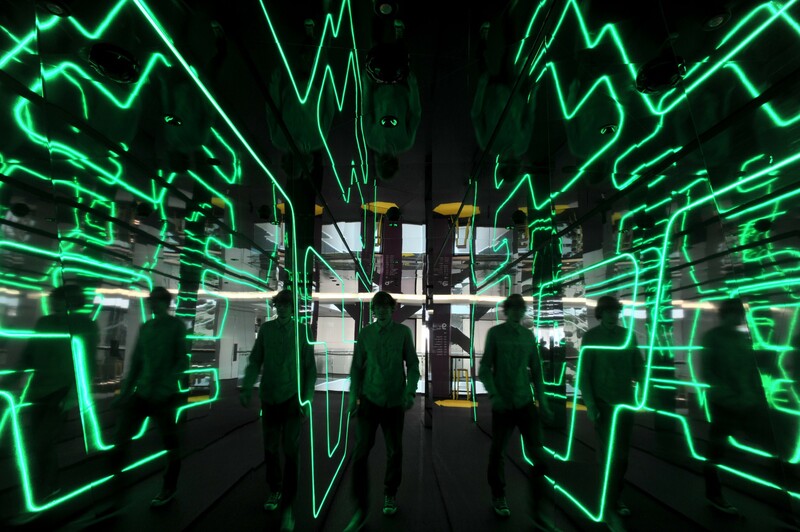 Every surface is writable to allow teams to easily visualize. Power comes from the ceiling, so if desks are needed they can be located anywhere on the floor. It’s like being able to have an offsite within your own office. You don’t need a specialized design space to encourage creativity. Start small. Get a few comfy chairs or a sofa and create a space away from people’s desks where they can go and work individually or as a small team. Consider replacing a board room table with smaller tables on wheels. Meeting room facilitation kits can be purchased for under $100 from any stationery store, and are extremely effective at keeping meetings on track. Great design is never done. We need to challenge ourselves to always be improving. Putting work into a digital format too quickly gives it a finality that discourages iteration on an idea. We encourage all teams to stay lo-fidelity for as long as possible, to allow an idea to breathe and grow. This is why we heavily use the very walls that hold up our building to visualize our work. 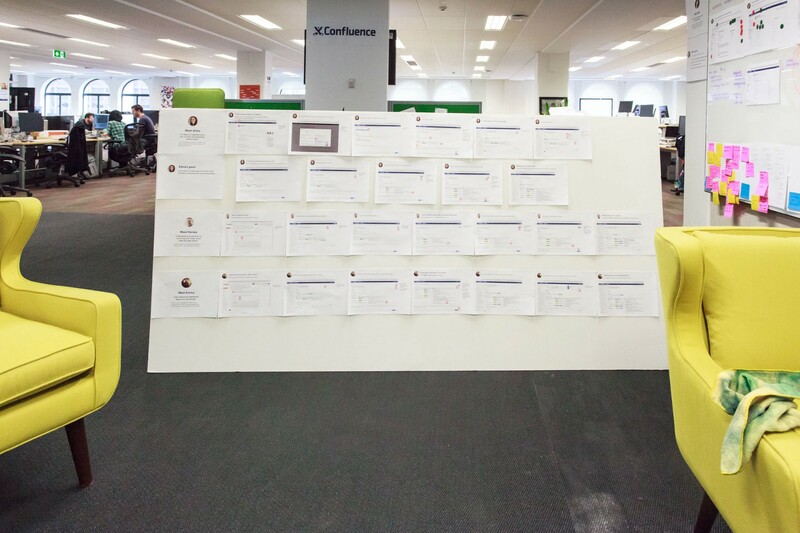 Publicly displaying work encourages feedback from our wider teams and is vital to iterating successfully on an idea. Our walls have evolved over time and we have now split our walls into three distinct categories. 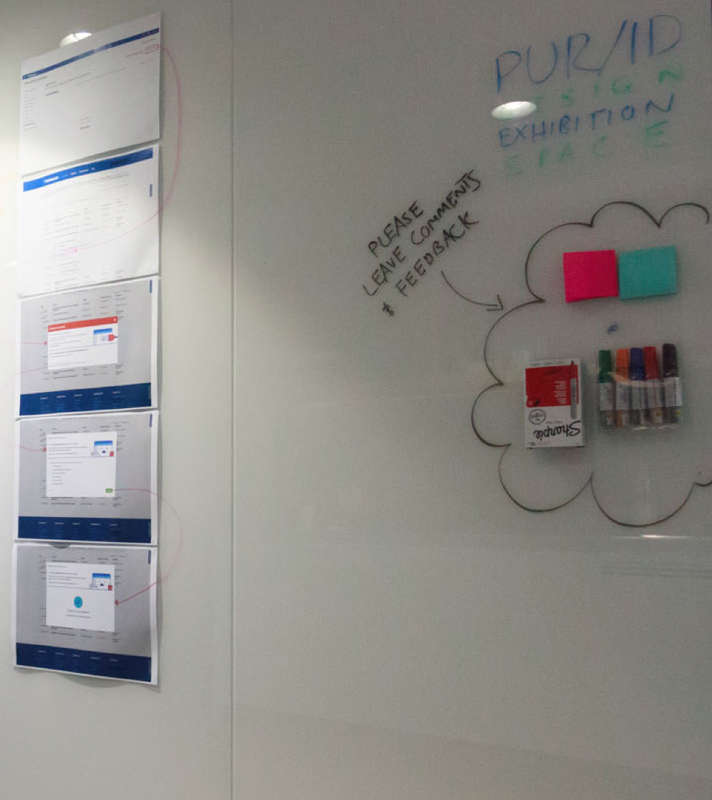 An exhibition wall showcases the key designs that a team is working through at that moment. The design must have the context set visibly on the wall. The persona the flow is intended for, for instance, and when a customer will see it. We also must display an end-to-end journey. We don’t want to design screens in silos and we’re interested in the end-to-end experience. We add feedback tools (like green and red dots to indicate likes or dislikes, Post-it notes, markers, etc.) to the wall which encourage people to give input as they walk past. We hold informal sparring (feedback) sessions at the walls as well. We used to have whiteboards on wheels. We’ve progressed to much larger walls covered in whiteboard paint. 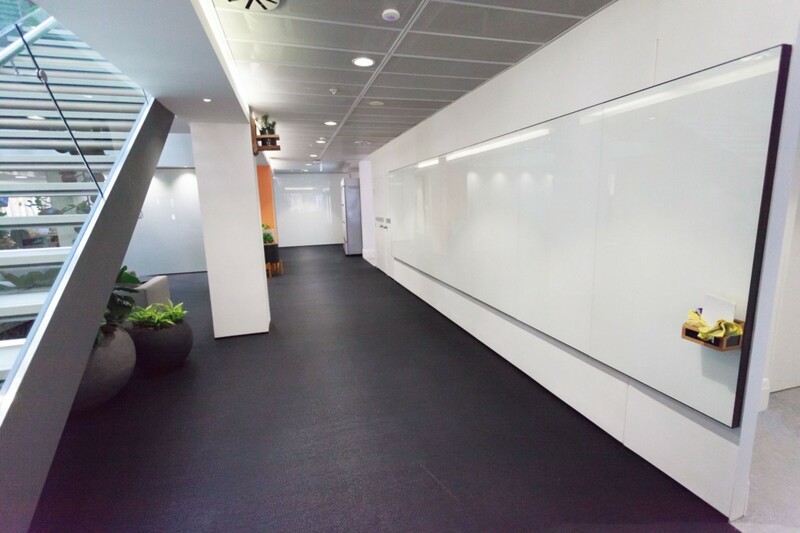 Now almost every wall surface in our office is covered in glass whiteboards. Because to properly iterate on an idea, you need to visualize, sketch out a flow, rub it out, draw something again, get feedback, rub out the idea, create a new one, get feedback, and use that feedback to build on top of your idea until you finally have something. This process can be messy, but the old saying “A picture is worth a thousand words” is very true. It’s much easier to show a colleague an idea than it is to just talk about it. 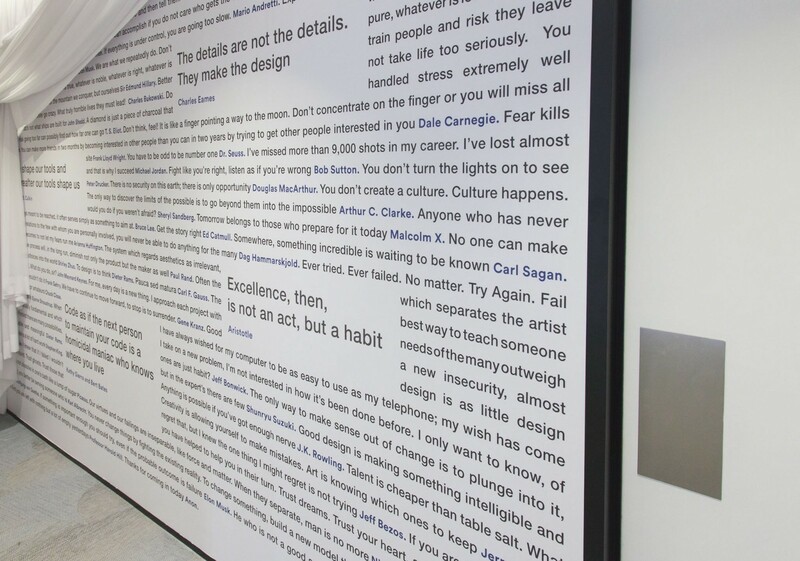 These walls encourage the iteration process that adds up to good design. The craft movement is alive and well. And we have embraced old school foam core at Atlassian to create transient walls. These allow us to take our designs wherever we go. If we need to take them into a meeting to discuss with a team we can, and then take them back to our desks to continue iterating on them. They’ve been very effective in helping us keep conversations moving and iterating on our work. Start small. You don’t need entire walls filled with expensive whiteboards. Start with any wall and get an end-to-end journey visualized. Set the context of the designs so that the wider team feels comfortable giving the right kind of feedback. Change the designs regularly (every two weeks) so that your team sees the progress and how the work is evolving. At the heart of design thinking is creativity. Designers are inherently creative and embrace the ambiguity of a creative process. But how do you encourage that creativity in cross-functional teams who might be less used to this type of work? We don’t design in silos, so it’s our job to make sure that other disciplines are engaged and involved in the design process. We have a number of statement walls around the office. Walls filled with curated quotes from designers, makers, and engineers who help inspire us. 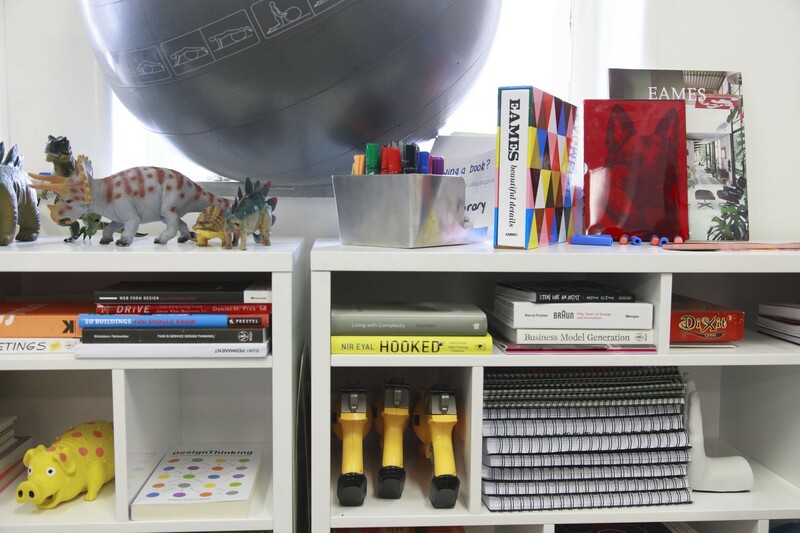 We encourage our teams to hack our own office space, personalizing it to make them feel creative. 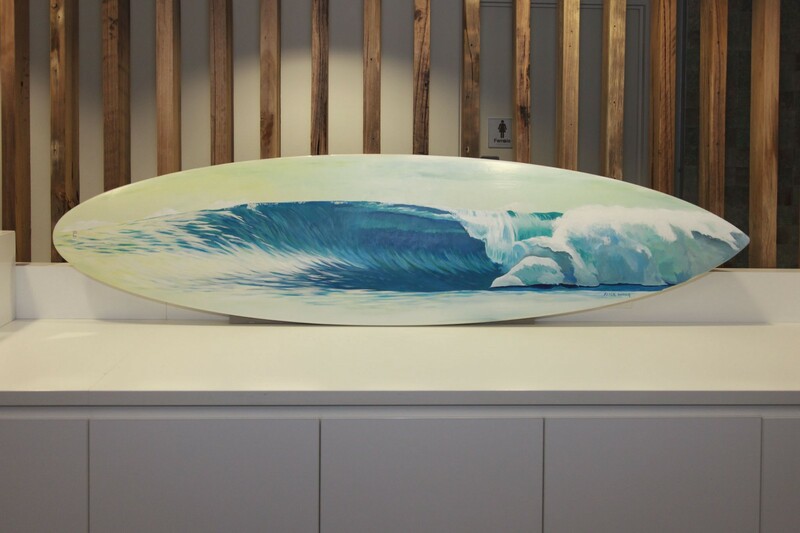 Individuals and teams have painted murals on walls, painted surfboards, framed art and t-shirts, and created posters to hang in the office. Art doesn’t need to be expensive, and encouraging the creative souls in your team to personalize your office can be one of the best moves you’ll make as a manager. We’ve even brought back the old school analog library. We have a quiet former bankers’ boardroom in our George Street office, and we encourage individuals to take a book from the library and go read it. Inspiration and creativity can be gained from reading, plus it helps spread design knowledge across the organization. Seek out the members of your team who are creative and encourage them to personalize the office space with paintings, murals, or printed posters. 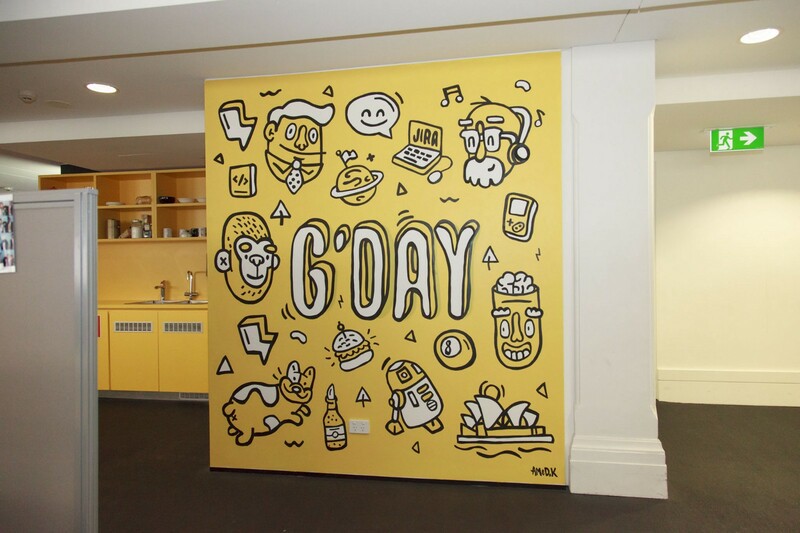 You could even use a hack day to get the entire team creating different pieces of art to display around the office. Many of the ideas above are relatively inexpensive. They just take a bit of thought and energy, and the gumption to pull together many common pieces of office equipment to make them more useful for all of your teams. Follow these guiding principles when considering the design of your office space. If you want to hear more, check out the talk Nat Jones and I gave at Web Directions 2015 about how our office space has evolved. Did you enjoy this post? Want more of the same? Consider following Designing Atlassian. Thanks to Nat Jones and Marie-Claire Dean.